To counteract the perceived threat of Russian space exploration during the Cold War, the United States boosted investment in research and computer science. Fearing the potential destruction of the national telephone line network, the United States turned to J.C.R. Licklider, a psychologist and computer scientist at MIT and DARPA to develop a robust, defensive alternative. Contemporaneously, Leonard Kleinrock, a computer scientist at UCLA, pursued the feasibility of packet switching, a method of information delivery that sends data in small "packets", or portions through different routes as a part of his doctoral research. This concept was thought to be a central component of the mechanics of the Internet, and would later lend a hand in the development of inter-network communication. The Advanced Research Projects Agency Network (ARPANET) was a branch of the United State's military and earliest iteration of the Internet. It used a packet-switching method to transmit information between various 'nodes' across the country via an IMP or Interface Message Processor. 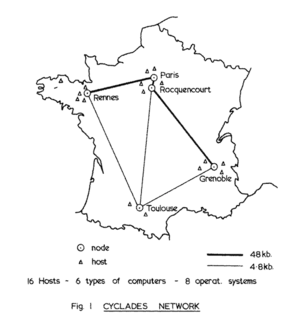 It was also the first network to use TCP/IP, developed by Vint Cerf and Robert Kahn. Nodes were delegated to different campuses located in Western and Northeastern United States. This process began in 1969 when BBN, a research and development firm based in Cambridge, Massachusetts, delivered the first Interface Message Processor, or IMP to Kleinrock at UCLA. Here, graduate students Vinton Cerf, Steve Crocker, Bill Naylor, Jon Postel and Mike Wingfield connected their node via hardware with the IMP. The work was a success and messages between the two machines passed without interference thereafter. Having secured ARPANET's closed network, Robert Kahn and Vinton Cerf collaborated on connecting multiple networks. This project later transitioned into Transmission Control Protocol/Internet Protocol (TCP/IP), and would allow multiple networks to interact and stand alone with security separate from their interconnected family. This also allowed a decentralized approach to managing networks. Davies originally conceived of a better way for computers to communicate with one another in 1965, and after a short break he returned to the NPL to turn the idea into reality. Davies succeeded in creating two short-lived networks Mark I and Mark II, both of which did not gain traction. After much research, Davies turned outward for support only to find a British populace unconvinced that a wide area network required funding. Believing their country to be technologically underdeveloped, French politicians made sweeping measures to grow the country's computing capacities, investing in government and educational institutions. Under government sponsorship, Louis Pouzin and others visited U.S. universities to learn more about ARPANET and packet switching. Pouzin thought ARPANET to be too complex and burdensome and decided to refine the packet process by individually labeling and sending each packet, not necessarily in sequential order and not necessarily with a connection between sender and receiver. The receiving computer would piece together the individual packets, or datagram. While this network was certainly seen as the European competitor to ARPANET, its creation informed many U.S. Internet innovators including Vint Cerf and Bob Kahn. In the late 1970s the French government withdrew its funding and disbanded Pouzin's team. It decided to back other networks that relied on circuit sharing, rather than the newer, riskier packet sharing. Pouzin's work went beyond CYCLADES, informing a class of American academics who went on to develop some of the essential structures of the internet. ↑ 1.0 1.1 Internet Society. A Brief History of the Internet Brief History of the Internet. Retrieved 19 Mar 2015. ↑ Joel Garreau. Radical Evolution. Retrieved 27 Mar 2015. ↑ Michael Hauben. ARPANET. Retrieved 26 Mar 2015. ↑ 5.0 5.1 The New Media Institute. History of the Internet. Retrieved 20 Mar 2015. ↑ 6.0 6.1 Donald Davies. Internet Hall of Fame. Retrieved 24 Mar 2015. ↑ 7.0 7.1 7.2 The Economist. The Internet's Fifth Man. Retrieved Mar 25 2015. This page was last edited on 3 May 2016, at 15:46.